I found the BABY NAMES poster pretty funny. When I clicked on it, a dart shot up out of nowhere and landed roughly between "Cashew" and "Rake." 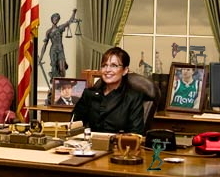 Still smirking, I trained my mouse somewhere on the desk, pushed the button on my touchpad and heard Palin croon, "Ohhh, here are the nucular codes!" That's when I lowered my head and surrendered myself to the pre-sob sinuses. This is the scariest thing I've ever seen in my life. Wow.